Household mold is an inevitable and natural part of our world. When outdoors, most molds are harmless and pose no threat to our everyday way of life. However, there are those pesky mold spores that invite themselves into your home and begin to grow and spread, causing mayhem. Anyone can use simple tips and tricks on how to get rid of mold in the house, but even these techniques don’t guarantee the tough mold won’t come back. It is important to know when it is appropriate to use DIY mold cleaning and when you may need to call for household mold remediation like ServiceMaster of Columbia. Here are just a few things to look out for that will help you know the difference. First of all, it’s essential to know the difference between mold cleanup and remediation. Yes, there is a difference! With mold clean up and removal, you are eliminating the mold that you can see with your naked eye. For example, if you find a small patch of mold caused by a water leak, you can remove the outbreak with effective cleaning techniques. For smaller and non-toxic mold growth, this will usually work just fine. Larger consistent, and potentially toxic outbreaks, household mold remediation is in order. Mold remediation focuses on getting mold levels back to its normal, natural levels. It’s virtually impossible to remove all traces of mold, but it is possible to get it under control. 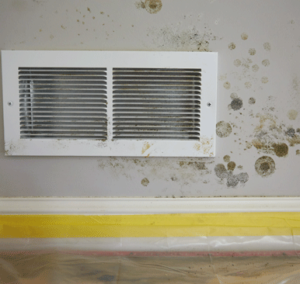 When Should I Turn To Household Mold Remediation Services? There are many ways to tell if you need to hire mold remediation experts! Here are just some of the signs to look out for if you’re suspecting a mold outbreak in your home. The organic materials in mold can cause materials to become discolored. If a mold colony is left to fester for some time, it will begin to become visible to the naked eye. At this point, it is best to call a mold remediation company for help. It is also important to note that not all mold is black in color. Some forms of mold can also be gray, white, brown, red, and even pastel colored. Colonizing molds can release a strange, musty scent. Most of the time, the odor will come and go. If you begin to notice this but don’t see any mold, it’s still a good idea to call the mold remediation experts. This could be a sign that mold is growing in places you can’t see, such as behind the walls or underneath the flooring! Also, do not solely depend on the presence of odor to determine if you have a mold issue. There are some forms of it that don’t release a scent, so it would be impossible to detect it with your nose. If there is any company that understands the importance of mold remediation with great customer service, it is ServiceMaster of Columbia. We also understand it’s important to act quickly, so you can be sure we’ll remove the mold and restore your peace of mind in a timely and skillful manner.